A Mississauga, Ont.-based vendor is throwing its hat into the mobile customer relationship management (CRM) ring. Front Row Solutions’ mobile CRM app is Front Row CRM and, according to CEO and founder Etien D’Hollander, its three-and-a-half-year-old solution was built around the sales rep. According to Front Row’s research, sales reps wanted an app that was easy to learn and use, is mobile-only, and will help them make money. They also wanted an app designed just for sales reps, not trying to be all things to all job functions. With Front Row CRM, the company claims a sales rep can complete a sales report after a call in 30 seconds on their mobile device. 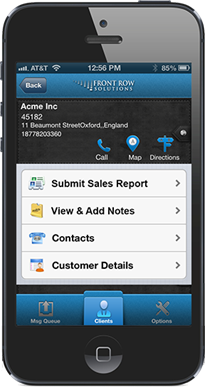 The app integrates into Sales Force, ACT, Sugar, MicroSoft Dynamics and other systems. It’s a hosted services, and reports can be made from an Andrif, Blackberry or iOS app, as well as from the mobile or desktop web or an SMS message. Features include custom dashboards, prospect tracking and a sales process activity card. “We have clients all over the world that use Front Row as either a standalone CRM or one that is integrated into their legacy CRM system,” said D’Hollander.